White birch trees are framed by the sea. In this print, birches grow among wildflowers in the salty sea air. 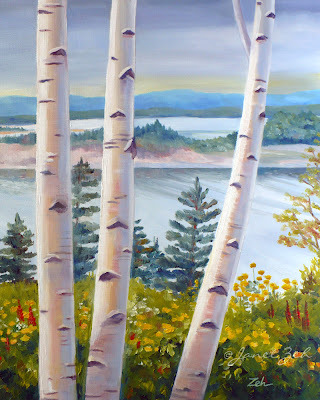 Birch Tree Nova Scotia print is available in several sizes and can optionally be framed, unframed or printed on canvas. Click the Order Print button below to see sizes, options and prices in my Fine Art Prints Shop.